Barbara Bissonnette is the Principal of Forward Motion Coaching, and specializes in career development coaching for individuals with Asperger’s Syndrome. This is a sponsored article. Since 2006, I have coached individuals with Asperger’s Syndrome on how to find and keep employment. My clients include young people who are entering the workforce, and individuals in their 30’s, 40’s, 50’s and 60’s. Job seekers work with me to explore occupations, learn interviewing skills, and develop effective job search plans. Employed people need help addressing performance problems, improving their interpersonal communication skills, or planning how to disclose their Asperger’s Syndrome and request accommodations. 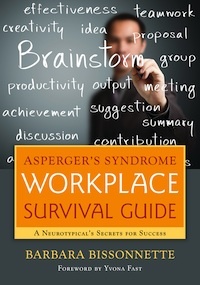 I wrote The Complete Guide to Getting a Job for People with Asperger’s Syndrome, and the Asperger’s Syndrome Workplace Survival Guide: A Neurotypical’s Secrets for Success to share ideas and strategies that my clients have used successfully. Here are my Top Ten Tips for getting a job and staying employed. 2. Target your job search. Looking for too many different jobs at once quickly becomes overwhelming, and makes it hard to prepare for interviews. Instead, limit your search to one or two job categories. 3. Rewrite your resume if it isn’t producing results. The purpose of a resume is getting an interview. It is a marketing document that must clearly communicate the value you bring to an employer. If you are qualified for the jobs you are applying to, but you are not getting interviews, you need to revise your resume. 4. Volunteer while you are looking for a job. This offers several benefits. It provides current experience to include in your resume. The people you interact with may know of job leads. It also adds structure to your week. (Usually, when people have too much free time, they have trouble getting things accomplished.) Try to find a volunteer opportunity that is related to the type of paid work you want. 5. Don’t mistake sending resumes with a job search plan. Passively sending resumes over the Internet is the hardest way to find work! Most people find jobs through networking, or direct contact with an employer (e.g. internship, part-time job). There are several ways to network that do not involve walking into a room full of strangers. An effective job search plan will have four or five activities that you perform on a consistent basis. 1. Develop hard skills that are that are in demand. Employers are more willing to overlook “eccentricities” in individuals who have technical skills and expertise that are hard to find. 2. Make the most of soft skills that you already possess. Communication is not the only important soft skill. Qualities such as honesty, helpfulness, loyalty, conscientiousness, and creativity are also valuable. Look for ways to maximize your personal attributes on the job. For example, is your work very accurate because you are careful and methodical? 3. Accept feedback and act on it. Some individuals resist employer feedback, questioning whether there is really a problem, or becoming angry when asked to change. Others become anxious and ignore the issue, hoping that it will resolve itself (this almost never happens). If a problem is brought to your attention, think about what you need to change in order to solve it. Get help from someone you trust, if necessary. 4. Consider disclosing to your employer. For some people, disclosing their Asperger’s Syndrome makes the difference between keeping and losing a job. The Americans with Disabilities Act compels employers to make accommodations for employees or applicants who have a disability. The Job Accommodation Network (www.askjan.org) offers free information about the Americans with Disabilities Act, workplace disclosure, and accommodations. 5. Find a work buddy. This is a colleague, preferably a peer or someone in your department, who can translate the myriad unspoken workplace rules for you. A work buddy can explain what the real job priorities are, suggest short cuts to improve your efficiency, or fill you in on office politics. While this can be a formal mentoring arrangement, most times, your work buddy is someone you like and trust. 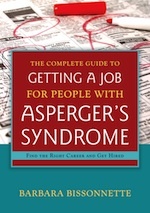 Barbara Bissonnette’s books, The Complete Guide to Getting a Job for People with Asperger’s Syndrome and Asperger’s Syndrome Workplace Survival Guide, are available from Jessica Kingsley Publishers. As a special benefit, Wrong Planet readers can get a 15% discount on Barbara’s books as well as on JKP’s complete list of books on autism, Asperger’s Syndrome and related conditions. Order on the JKP website using voucher code JOBS13 on or before July 31, 2013 to receive the discount. Jessica Kingsley has over 500 books, videos and other resources in print covering all aspects of the autism spectrum. Click this link to sign up for a free copy of JKP’s Complete Autism Catalog. Keep up-to-date on the latest new books, contests, author events and other fun stuff by “liking” the JKP Autism Community on Facebook. “The Complete Guide to Getting a Job for People with Asperger’s Syndrome” is an excellent resource for anyone with ASD that needs help choosing a career, finding a job, or managing the social complexities in the workplace. Author Barbara Bissionnette is an expert on her topic and has written a book with so much great advice, it should be required reading for anyone that is having a tough time finding a job or facing challenges at work. Parents of adult children with ASD will find he book’s information extremely valuable in their own efforts to support their adult child in the workplace. The book is comprehensive in scope with topics on effective job search plans, successful marketing and networking strategies, insightful interviewing techniques, tips on how to stay motivated during a job search, when to disclose a disability, and how to request workplace accommodations – pretty much anything a person with ASD needs to know to become successful at work. Throughout the book are great organization tools with templates of profiles, checklists, and planners that can be copied or downloaded by the reader. If you have ASD and are just starting your job search, looking for a job more than 6 months, or fired from numerous jobs over the last few years, this book was written for you! Friends of Wrong Planet receive a 15% discount off their purchase, so don’t forget to enter voucher code JOBS13 when placing your order. I don’t like ASD employment advise. Don’t wanna be fake to get a job. I agree whole-heartedly with getting a work buddy to fill you in on all the things people do at work and to gain information. A good tip to asking this is memorizing some lines from movies and improvise. I memorize loads of lines from many sources and use my smile to be a filler. I don’t use direct quotes, but some line here and there works and don’t forget to smile. I also agree with holding onto “soft skills that you already possess.” Most employers want someone who is consistent with their behavior and performance at work rather than bringing on emotional excuses to your ‘shortcomings’. You don’t have to be fantastic at communicating or genius at photography, but if you are willing to be “honest, helpful, loyal, conscientious, and creative,” you can hold your own ground anywhere you work. I don’t have a job at the skyscrapers or a fantastic salary but I hold my own principles and routine that I’m proud of. I am not fake when I mimic other people. I just use their own devices and system to get what I want, and that is a job that pays for my living expenses. I really hate to be a sorry excuse or a whiny bum. I really need this. Thank u so much for sharing because i am not able to keep my job for freaking a month. but now i am having confident and also will follow these tips to keep my job. I believe that research paper editing will help you in correcting the statement for job. I concur with you that volunteering can truly assist work seeker with landing a great job. This article is extremely useful and sympathetically keep doing awesome. The above tips on how to get and keep a job are very helpful. You can always visit http://www.expertresearchwriters.com/Dissertation_Literature_Review_Help_614.html whenever you are in need of reliable dissertation literature review help. I’ve tried all the above tips from the article and then some. I am 52. Failed at every job I had. I was good and happy with my jobs. The problem is I don’t fit in a social gathering. I tried and never found a buddy. The last place I worked at was the worst bullying work environment I had been in. When I was diagnosed with depression and anxiety (my asperger’s symptoms have not diagnosed by a doctor). Anyway, I forget to mention that my boss was the biggest bully of the group. So, I told him about my diagnosis. The bullying from my co-workings and him became worse. I was not aware that human resources could help me keep my job. This bullying at work came at the same time as I was going through a difficult time in my personal life. I had to quit, I became crippled by my depression and anxiety. I am currently unemployed even after years of therapy, medication, and trying part-time jobs. I haven’t given up in having a job, I’ve thought many times applying for a job. That thought puts me into a panic attack. I have been, for years now, looking for a legitimate company that hires people to work at home. I just finding scams. No one wants to be around someone who is socially awkward. I feel like I’m diseased at a work place and must be removed. There is so much that once can learn about Asperger’s Syndrome from simply reading this article. Many thanks for providing us with this information. You may want to click on http://www.questessays.com/research-paper/research-proposal-writing-help-thesis-proposal-writing-service/ for professional yet affordable research proposal writing help. These tips have nothing to do with autism. It’s the most standard, anywhere and everyone on the internet type of advice about looking for a job. Thanks but yeah what? الان تعرف علي افضل الطرق في صيانة التكييفات من صيانة كاريير التي تعمل مع مجموعه متخصصة من الخبراء تواصل معهم عبر صيانة تكييفات كاريير في اي وقت . الان افضل شركة حراسات امنية يمكنك التواصل معها للتمتع بالمزيد من الخدمات في مجالات امن وحراسة الافراد والممتكات في اسرع وقت ممكن . احصل الان علي افضل الخدمات من صيانة امريكول والتي تعتبر من اهم وافضل التوكيلات للصيانة المعتمدة في مصر عليك التواصل معنا في ارسع وقت ممكن . الان اقل الاسعار من جليسة مسنين متخصصة يمكنك الان التوالص معها علي مدار ال 24 ساعة لطلب خدمات الرعاية في اسرع وقت وعلي ايدي خبراء . So happy there is actually a book out there that talks about job searching and keeping a job! The difficulties of disclosing are real, but I can attest that when you do find a workplace that is understanding and willing to work with you it makes all of the difference. Be willing to grow and expand out but recognize when you need to return to your comfort zone. i just got a copy of the first book listed here (waiting for it to arrive) and excited to workout what the hell i’m ‘missing’ when applying for jobs. plus how to stop being weird with NTs in interviews and stop getting fired by people i’m more intelligent than because i ask ‘too many’ questions. want a copy of the second book too.